Wade Hampton Golf Club was named after the respected Confederate cavalry leader, General Wade Hampton III, who was also Governor of South Carolina and later US Senator during the 19th century. 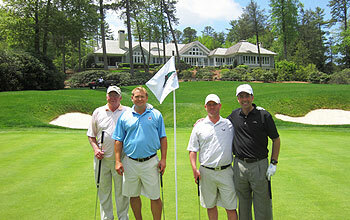 Surprisingly, the Wade Hampton Golf Club is a totally modern and thoroughly exciting affair. You’ll need an invite from one of the members to play this “Tom Fazio Masterpiece” as it is lovingly named and it opened for play in 1987. The course caters for golfers of all levels, measuring a manageable 5,120 yards from the forward “Chimney Top” tees, named after the Blue Ridge Mountain peak which provides a dramatic backdrop, exemplified on the short par four 12th. Gigantic pine trees that are simply dwarfed by the sheer white rock face of Chimney Top Rock surround the green and the approach on 12. However, going back to tees, you’ll need your game intact to tackle the tips, better known as the “Fazio” tees, Wade Hampton stretches out to a whopping 7,109 yards from here. Categorised as a mountain course, Wade Hampton has slick, undulating greens and tight fairways. Despite its mountain setting, the elevation changes are relatively modest but be prepared tackle plenty of water hazards. The course reopened in the summer of 2018 after a year-long renovation by Fazio Design. All of the putting surfaces were reconstructed to USGA specification, with underground drainage replaced and re-connected to the existing SubAir infrastructure. Putting surfaces were reseeded with Pure Distinction bentgrass, green surrounds replaced with Crystal BlueLinks bentgrass, and greenside bunkers rebuilt with a Capillary Concrete bunker lining. Wade Hampton sits at 3,650 feet in elevation. The course begins on the highest point on the property with a 534-yard par five that plays down into a big valley. The course is essentially built into the mountain and has a lot of elevation change. The major characteristics of the course are its brilliant use of the elevation, its lushness and the creative routing through the large and omnipresent trees. The par threes at Wade Hampton, as with most Fazio courses, are all very good. The sixth hole is a good example. It plays 152 yards downhill. In a very interesting design feature, the water in front of the green flows over a large granite slab that slopes down the hill. I came up short and my ball bounced off the rock onto the green. Apparently, there has been a hole in one recorded on this hole from a ricochet off the rock. The 172-yard par three eleventh is another downhill beauty that uses the trees and bunkers to perfectly frame this verdant hole. At least twelve holes at Wade Hampton play from an elevated tee box and the thirteenth is the most dramatic of them all. The 406-yard hole plays from an elevated tee and the second shot is also down a hill to the green. The eighteenth is a really good short par five finishing hole that gets progressively narrower from tee to green. Down its entire left hand side there is a stream and the fairway slopes right to left. It is equally as magnificent viewed from either the tee or the green. The intoxicating clubhouse provides a welcome distraction as you approach the green. It has a series of cascading porches, verandas and patios and exudes understated Southern elegance. The boys put some serious money into this exclusive mountain hideaway. Wade Hampton has to go down as one of the most spectacular courses in the world. That might seem like a massive overstatement but the way the course winds its way through the stunning Blue Ridge mountains is truly breath-taking. I was lucky enough to play it in October when the Autumnal colours were at their most splendid. Throw in some sparkling mountain lakes and a spattering of wildlife and it really makes for a quite wonderful setting. The golf course certainly does the surroundings justice too. The opening tee shot playing down into a valley sets the scene for an immensely enjoyable 18 holes to follow. The par three 3rd, with its green tucked into the mountainside next to a small waterfall is a magnificent hole, and extremely demanding to boot. The course offers a real test of golf as the regularly changing undulations, direction of play, length and layout of holes etc ensure that very few of the same shots are played. I certainly seemed to use almost every club in the bag. I've been lucky enough to play numerous exceptional courses including the likes of Muirfield, Royal County Down, Sunningdale, Peachtree and Monte Rei, however if I had to choose one course to play for the rest of my life, I would have to say Wade Hampton would get the nod. Wade Hampton Golf Club is an amazing course in the North Carolina Mountains, located in Cashiers. Wade Hampton was the golf course that really put Tom Fazio on the map, and we all know now that there is no designer with more top 100 courses than Fazio. The great thing about the course I thought was it is actually sitting down in a valley, so it provides the most amazing views of the mountains off behind you, and allows you to really take in the whole golf experience. Mr. Jeffrey Heilbrun the General Manager was an amazing host; we were blessed with an absolute beautiful day in the middle of a thunderstorm weekend, like it was pre determined that we were meant to play the Fazio gem. One of the greatest aspects of the course is that, you never really get to see another golf hole and get distracted with the layout, you get to just come to each tee box surprised, and with holes like 18, there is not much better than your approach shot to the club house with water left, and the Fazio coffin bunkers protecting it as General Wade Hampton would have wanted., Bottom line bucket list course and experience. I recommend to anyone. The drive from Ashville, NC airport to the quiet mountain town of Cashiers, NC is an experience in itself. The ironic thing is that if you run out of gas or puncture a tire, you’ll quickly discover that you don’t have reception on your mobile phone – so drive carefully! Tom Fazio is the architect at Wade Hampton and resides in the town of Cashiers. Fazio is not scared of building world class masterpieces and does whatever it takes. Surrounded by spectacular mountains, dynamite was required for multiple fairways so that the preferred routing could be satisfied. When this course was being built, varying opinions weighed in on where many of the holes on the front nine would be, but the final result is not just a USA top 100 layout, but a World top 100 resident. Generous landing areas exist, although don’t be fooled into always hitting the big dog. The scratch player will find themselves pulling 3 wood more times than not to avoid excellent fairway bunker complexes, ponds, hidden creeks and to realize that you’re better off with a full shot into elevated greens. I often joke with myself that Fazio must have gotten lost or had a screw loose when he decided on some of this locations (eg: Wade Hampton, Shadow Creek, Victoria National) purely because of the remote nature or the seemingly impossibility to create 18 holes – but he always comes up trump. The privacy at Wade Hampton is something which I have not experienced very often and you really feel like a king for a day. Excellent playing conditions and mouth-watering tee box visuals offer a crescendo all the way to the 18th and beyond. By some considerable distance, this is Tom Fazio’s finest design. The routing of the course is incredible given the setting and green sites are at times jaw dropping. I’ve played many great courses around the world, more than half of the world top 100, and Wade Hampton is in my personal top 10. Was lucky enough to get an invite from a friend who became a member and I’ve now played it three times and each time it gets better. Service, conditioning, challenge and the scenic backdrop are pure class.